When we think about rain (in moderation) we generally think about how great it is for our farms, agriculture, nature and overall ecosystem. However, something not often thought about is how it effects our spill pallets, especially if they overflow or become contaminated. If rainwater or other liquids find their way into your bund’s (spill pallet’s) sump, it could severely compromise the bund’s capacity. This can lead to overflow, pushing out leaks and spills of stored substances, and lead to a costly, time-consuming clean-up. This is especially relevant when storing liquids outdoors in winter or in wet environments. It is widely regarded as best practise that a sump should be able to hold at least 110% of the largest container stored on the bund. For example, if you are storing 205L drums, you require a sump capacity of at least 225.5L. So what should I look for in a Spill pallet cover? An ideal spill pallet cover includes tie-down straps, sturdy zips, water resistance, and is manufactured from UV-stable material. 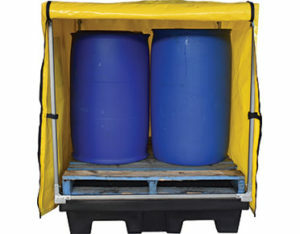 Spill pallets can come in a large range of sizes from small singular bunds to huge double IBC. Other than offering protection from rainwater and contamination, spill pallet covers also assist with a neater workplace, saving time and money whilst helping you reduce the possibility of potentially dangerous spills.